This trick is very useful and so easy to do, you don't need to restart every disconnected download from mediafire and enterupload even the download links have expired for days. As we know these two file hosting (Mediafire and Enterupload) support resume capability, but each has its own rules. Mediafire allows download to continue as long as the internet connection is online with the same static IP for at least within 24 hours. But if your IP is changed or the links have passed the 24 hours limit, you will not be able to continue download and you must restart the download from the beginning. As for Enterupload, you may resume download even if your IP is dynamic and changes frequently but you should never exceed 24 hours so the download links will be expired. Update: Enterupload doesn't exist now, but this trick can be applied to all file hosting that support resume ability. In normal case those rules won't bother you, but sometimes "shits happen" and you never know when or why it happen to you? You may have experienced this badluck when your download was suddenly stopped and disconnected because of electricity failure, problem with your internet connection or those the unexpected "badluck". So your download has to be restarted from the very beginning. Trust me, I've been in this situation many times. But good news for you, I have now come with the perfect solution regarding this. 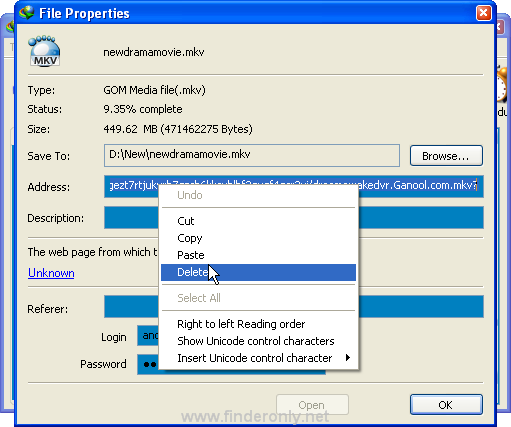 You are now able to resume your disconnected download from Mediafire and Enterupload without restarting (from the zero) and you can continue the download from the earliest position (percentage), simply follow these steps: Note: This trick is perfectly tested on IDM and it should also works in other download accelerator. Please use this trick with IDM to apply. When the Properties Window appears, block the download "Address" tab (which is already expired) and delete it. Now open your browser and go the download address to get a new fresh download link from the same file you wish to resume, right click and "copy link address". But be sure to clear your browser cookies and cache before you get to this step. Back to IDM download properties and paste the new download link to the Address tab then click OK button. Now you have a fresh download link (which is the same file with the unfinished one), simply right click and choose "Resume Download". By doing this trick you don't need to restart download from the very beginning, but you can resume the download process without loosing the downloaded part of your files as well as your time. You can do this for Enterupload too, just get the new fresh download link and follow the same steps. No more worry about expired links, as long as the files are still on the server, you can do this whenever you want even it has passed a month. Want to increase your download speed? Then try improving internet connection without software by doing some easy tweak for your computer. Good Luck!